On the sports quest and in a hurry? Race to the bottom of this post for a short list of especially good books. Interested in how librarians decide what book goes where? Interested in being able to just walk confidently to the section that has the books you want? Continue on. So a lot of stuff has to go in 796. Everything from football to kite flying, but no swimming or skiing. Before you read how the 796 sports are classified according to Dewey you might want to think about all the sports you know and how you might group them. Imagine some sort of super-sorting hat. Finished? 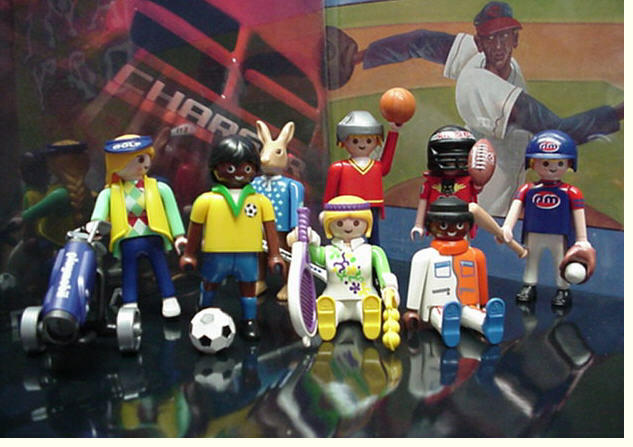 Did you distinguish between team and individual sports? Dewey didn't. Okay, this is the Dewey way, in which baseball is closer to croquet than it is to football and field hockey is unrelated to ice hockey. Let's zoom in and look at ball games. By the time you get here, 796.3, you still have all sorts of possibilities and a label that is growing longer and longer. Better hope it is not a skinny book you are after or there won't be room for all the numbers. Dewey lived in a very different world. Please remember, the biography of a sports person will be found in the section for that sport. But sports fiction will be scattered about in the many fiction sections. We have a lot of great sports fiction - from Frank and Ernest Play Ball to The Iowa Baseball Confederacy. In the children's room these books will be identified by a red label, in the adult room you are on your own. Here is the promised special list for the questers. __ Mike Lupica, the ESPN sports commentator, has published a trio of sports novels: Heat (J PA), Travel Team (JFIC LUPICA) and Miracle On 49 St. (J FIC LUPICA). Both Heat and Travel Team also are available on CD. __ Dan Gutman is famous for his humorous, action-packed sports novels, including Abner and Me: A Baseball Card Adventure (J FIC GUTMAN), The Million Dollar Putt (J FUC GUTMAN), The MiIllion Dollar Shot (J FIC GUTMAN) and The Million Dollar Goal (J FIC GUTMAN). __ Local attorney and author Fred Bowen has written several sports novels based on true events, including Full Court Fever, On the Line, and Playoff Dreams (all are J PA). __ Matt Christopher is perhaps the most popular sports author for kids, writing both novels and non-fiction. Our library has a number of Christopher's books, including: Football Fugitive (J PA), The Dog That Pitched A No-Hitter (J FIC CHRISTO), Baseball Jokes and Riddles (J 818 CHRISTO). Did you get a myth quest? You are not limited to the Greek/Roman myths you learn in school (though we have many wonderful books on those) but consider Norse myths (Wóden's Day, �unor's Day, Fríge's Day), African myths, Native American Myths and so on. Everyone has myths. 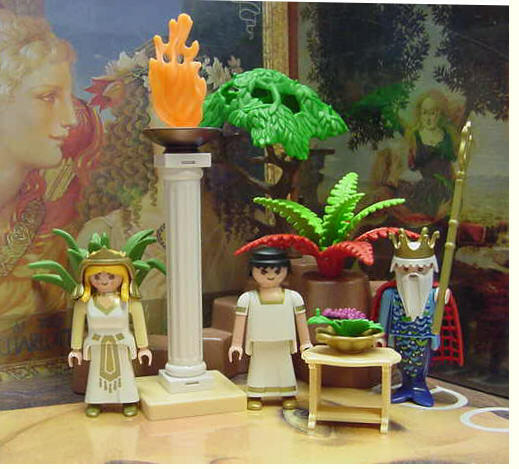 Many books of mythology sit scattered about in 290s, but myth is a rather vague category and can overlap into legends and magic (398.4) and many other unexpected locations. Example: Star Tales by Ian Ridpath which is in 523.8. And for kids (and adults) who enjoyed the Riodan books: try other fiction based on Greek mythology. Music? We do have some parts of the Ring Cycle as sound recordings, the printed librettos and graphic novel versions as well. Our CD collection includes Handel's Semele. Many other operas based on Greek myth, including Elektra, Orfeo ed Euridice, La Belle Helene and Ariadne auf Naxos are now widely available on DVD. Art? Everywhere. Myth has always been a major subject (the major subject?) for art in most cultures. Look through our 34 volume (and they're not skinny) Dictionary of Art, or browse through our oversized circulating book section. Need help finding them? Please ask at the desk. Books of cartoons and comics, as well as graphic novels, usually fit into a Dewey section reserved for drawings, 741.5, and we have books there that range from Calvin and Hobbes to classic manga. Scores of books, a great collection. We shelve these books in three locations: for adults, for teens, and for younger children - as a rough sort of guide as to content. Occasioally a cartoon book will be classified by the subject instead of the style. A Cartoon History of the District of Columbia is not in drawing but in DC history 975.3, so don't feel restricted to just the 741.5 books if you are on a cartoon quest. Another example is What do authors do? by Eileen Christelow which you can find at J 808.068. Library staff member Dave Burbank, trained in both theater and art, designs our Summer Quest. If you have not seen his art, please come in. Dave also maintains our graphic novels wiki, acts as our Comic Con emissary, and has taught both drawing and Dungeons and Dragons for the recreation department. Footnote: Have you seen toonopedia? One of our summer quests sends the reader in search of ancient history, fiction or non-fiction, but you don't have to be a quester to enjoy a good book about Greece or Machu Picchu. Here are the Dewey numbers for ancient history. If you are interested in Druids you could go to 936.2 for The Life and Death of a Druid Prince, walk over to the fiction section for The Druid King by Norman Spinrad, check the children's room under 741.5 (comics) for several Asterix collections, and return to the adult side to sample some fantasy by Terry Brooks. Ancient Egypt? Sit down in the reference room with Atlas of Ancient Egypt (R 932). Look for Cat Mummies (J 932) in the children's room, and while you are in there check out For All Time by Caroline B. Cooney, or Pharaoh's Daughter by Julius Lester (both J Fic). Over on the adult side you can find several fascinating non-fiction books such as Reflections of Osiris : Lives from Ancient Egypt (932.1), and finally settle down with a novel by Arthur Phillips or one of the many mysteries of Elizabeth Peters. Though we don't have a copy of Norma for the Druid enthusiasts, we do have some extracts from Aida. And so on. Whatever part of ancient history interests you, you can look through art books, history books, fiction, atlases (check the atlas case too), biographies. Stranger in a Strange Land, first published in 1961, was read by many, many people who did not usually read science fiction. It won a Hugo, and introduced the word grok to the '60s. In 1991 Heinlein's much longer, original version was published. Is it better? Did you know the phrase pay it forward was coined by Heinlein? 1951: In Between Planets. Here is an ad-free list of novels that won Hugo awards. Hugo awards by catagory, but this list is not up-to-date. Dinosaurs rule at the Takoma Park Md. Library! We�ve got 70 books in the main Dewey Decimal number for dinosaurs 567.9. Some of these books are in the adult section, some in the reference room, but many are on the shelves in the Children�s Room. Among these books are Dinosaur Discoveries by Gail Gibbons (J 567.9 GIBBONS), The Dinosaur Atlas by Don Lessem (J 567.9 LESSEM) and The Ultimate Dinosaur Book by David Lambert (J 567.9 LAMBERT). Can You See What I See-Dinosaurs by Walter Wick. This board book for the littlest readers can be found in the board book tower in the Children�s Room. Danny and the Dinosaur by Syd Hoff (J r HOFF) a book for beginning readers. Look for it in our beginning reader bookshelf. The Enormous Egg, a classic novel by Oliver Butterworth. Much of the novel (J FIC BUTTERW) takes place at the Smithsonian�s Natural History Museum. Author Jane Yolen and illustrator Mark Teague have teamed up on a trio of hilarious picture books featuring dinosaurs as temperamental toddlers: How Do Dinosaurs Eat Their Food? How Do Dinosaurs Get Well Soon? And How Do Dinosaurs Say Goodnight? Dragon Bones and Dinosaur Eggs: A Photobiography of Explorer Roy Chapman Andrews (J B ANREWS) by Ann Bausum. The Dinosaurs of Waterhouse Hawkins (J B HAWKINS), a biography of a Victorian artist who built life-size models of dinosaurs in hopes of educating people about them. The book is written by Barbara Kerley and illustrated by Brian O. Selznick, who won a Caldecott Honor for the illustrations. Raptor Red (SF Bakker) by paleontologist Robert Bakker, who was one of the first to postulate warm-blooded dinosaurs as the ancestors of birds. Raptor Red tells the story of the lifecycle of one particular Utah raptor, it reads like a well-filmed nature documentary, with thrilling hunt sequences etc. The Dinosaur Heresies (576.91 BAKKER) was a groundbreaking text that changed the science of paleontology. It's illustrated throughout by Bakker's sketches and lays the case for Dinos as endothermic (self-heated, warm-blooded) fast hunters. Also of course: Jurassic Park and The Lost World by Michael Crichton (FIC CRICHTO). Interested in local dinosaurs, ones found around here, in DC or Maryland? We have two books by Peter Kranz: Dinosaurs in Maryland and Dinosaurs of the District of Columbia Look carefully at the Dinofund site. You can even go on a dino dig with them in the Washington Metro area !